Hitch-hiking Cartoon Series: I worked up these rough drawings in hopes of getting them published. But alas that didn't happen. In the 1960's hitch-hiking took on a whole new look. Of course in the movies the most famous hitch-hiking scene was in:"It Happened One Night" with Clark Gable. Any port in the storm! These were hitch-hiking scenes I actually saw. This was the letter I sent along with the cartoon ideas to the editor of EYE magazine. 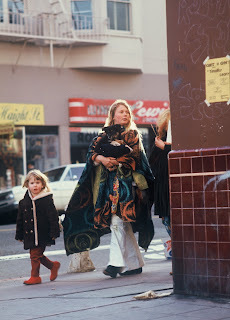 This is one of my favorite "street photos" from the old "Summer of Love" Haight Ashbury days. 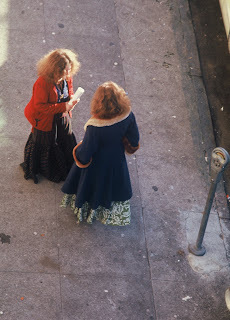 Shot on the corner of Cole and Haight Street. Note: the child sees me but nobody else notices I'm sneaking this shot. It looks like the dog is getting better treatment than the child. I was sitting in a parked car using a 135mm lens. Good thing nobody saw me....they might have thought I was a "nark"! 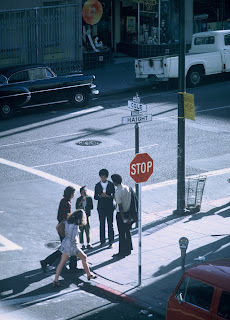 I was living on Cole Street at the time with my first wife, and just getting into still photography. Note: if you click on this photo you will see amazing detail! There's a Timothy Leary flyer taped to the wall of the then Haight-Straight theater. Hey folks this is real history here! 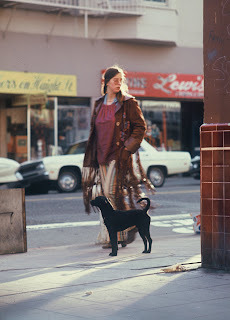 The Haight was not all "love & peace". Tear gas was floating around many nights. The sidewalks were dirty. the Golden Gate Park panhandle was a mess. Lots of lost soles. When I left there....every store window was boarded up from street riots. It's all nice now, 38 year later. There's a great documentary film:"Finding Sean" that covers this time and place.